Launching home-made UFOs at a Gloucestershire campsite. I was expecting to write a post this weekend to the effect of “all the walls are now covered with hessian”. This is great news sonically, but doesn’t necessarily make a very interesting blog entry, considering that you probably now know (more than) everything you ever wanted to know about frames, fabric and sound absorption etc. I’ve just been away at a camping weekend with the family (also playing bass for a blues scratch-band – kinda DIY music festival for a couple of hundred people). Before we left I had a quick look at the studio in progress and asked Artis if there was anything he needed while we were away overnight. 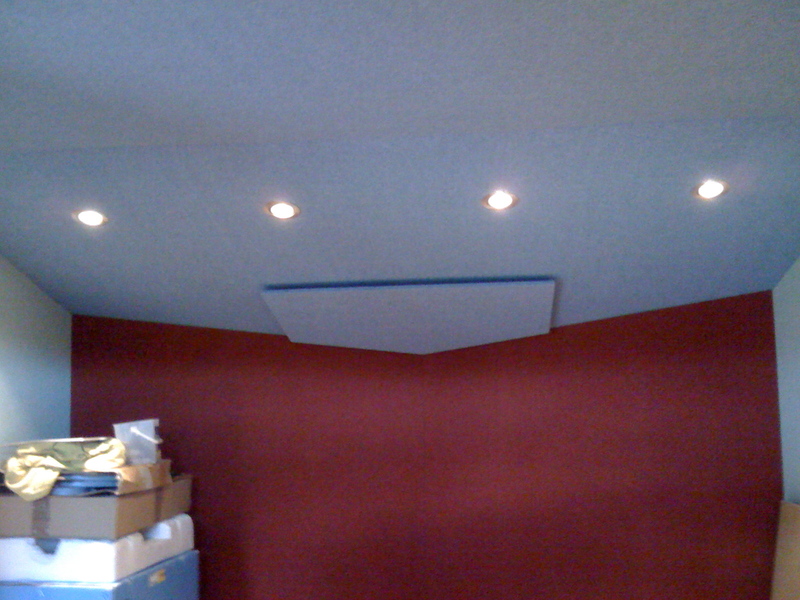 He asked if it would be OK for him to cover the air ducts in the live room with ‘interesting shapes’. He suggested that the room was starting to feel a bit austere (when someone says the words “like a dark prison” very slowly in a Latvian accent, it is difficult not to think of Count Dracula). 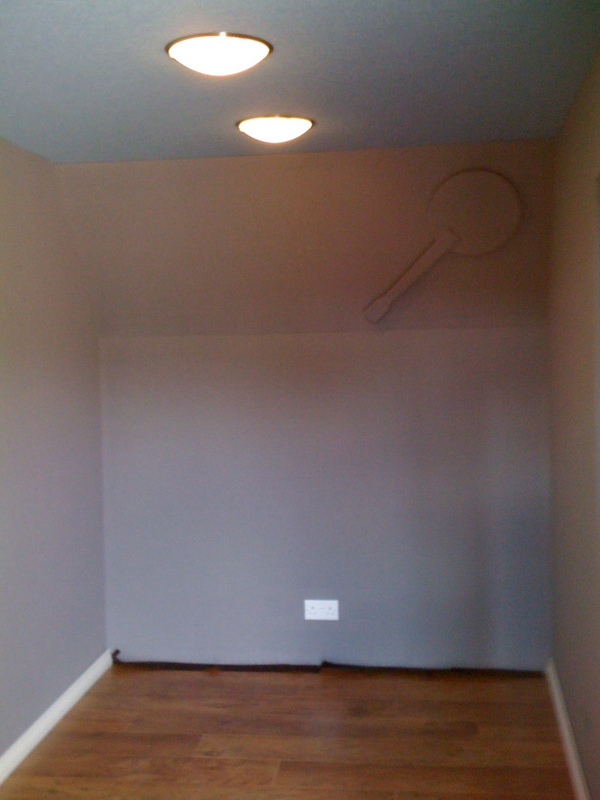 Given that Artis has a real craftsman’s eye, I figured that whatever he had in mind would be tasteful, and way cooler than any suggestion I would make – so I left him to it. When we returned it was blisteringly hot day so I went straight down to the studio, partly to see what Artis had done, and partly because it’s really cool in there: the sound isolation is so heavy that the building’s interior temperature is pretty much unaffected by the weather. He’d completed all the hessian frames in both rooms, plus all the window frame pieces, and had made the MDF/hessian panels to covered the air inlets as planned. And… he’d made them all in the shape of guitars! I’m speechless with delight. Here are some pictures while I calm down. 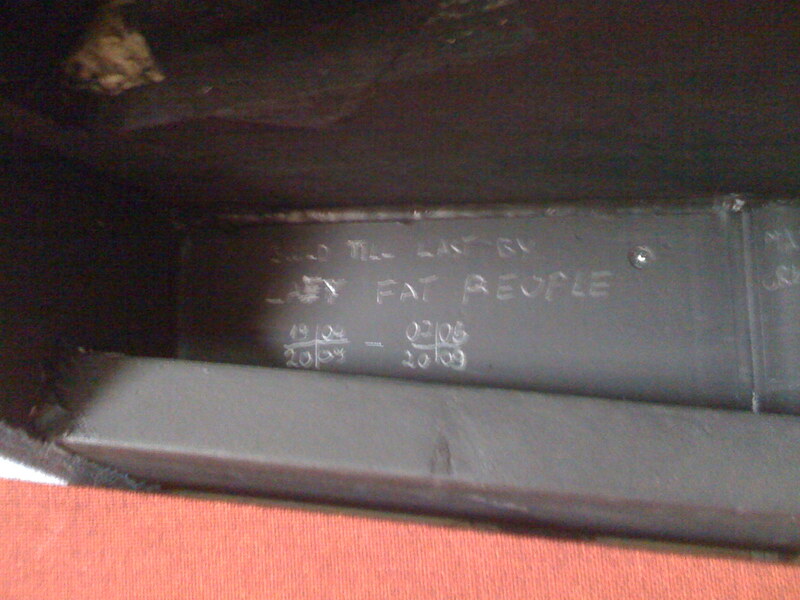 Although it conceals Artis' secret signature inside, which reads "Build Till Last (built to last) by LAZY FAT PEOPLE." 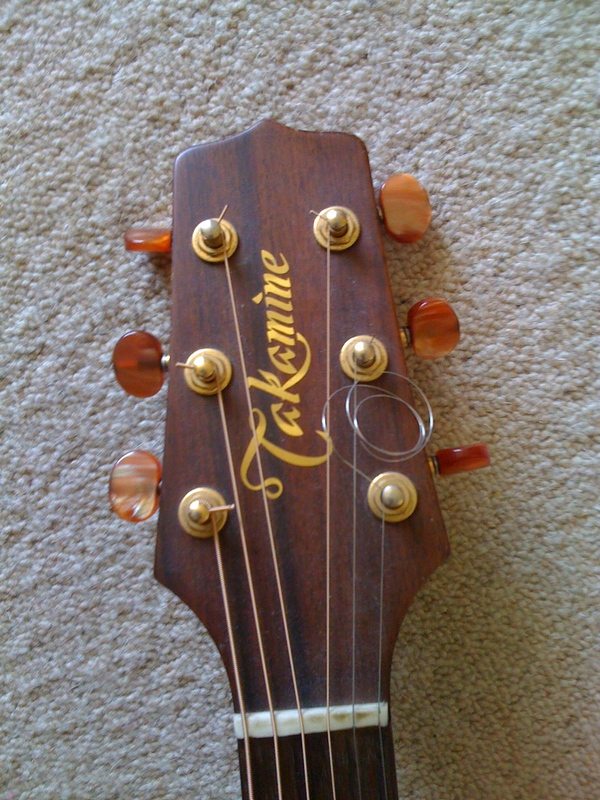 The circle represents the banjo - the headstock is from my banjolele. 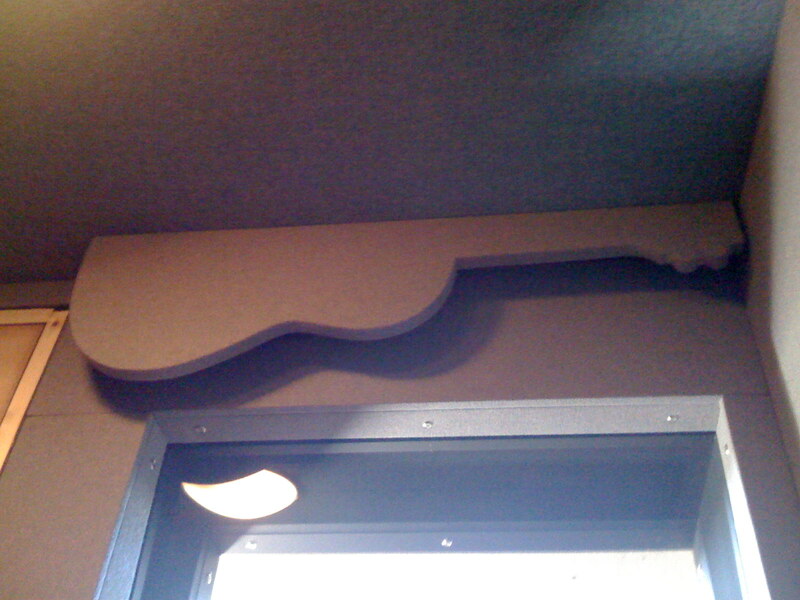 Cool air comes from the now-concealed duct. 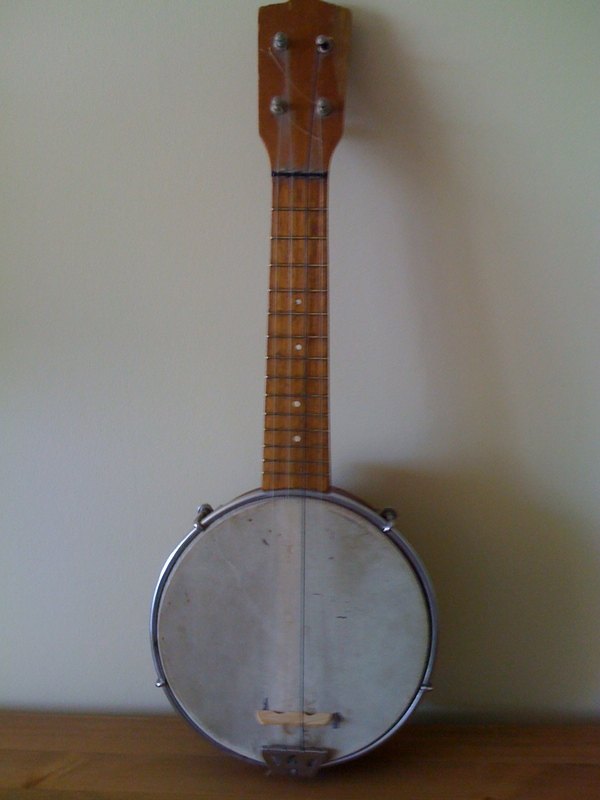 And this is my banjolele - the first musical instrument I ever bought. 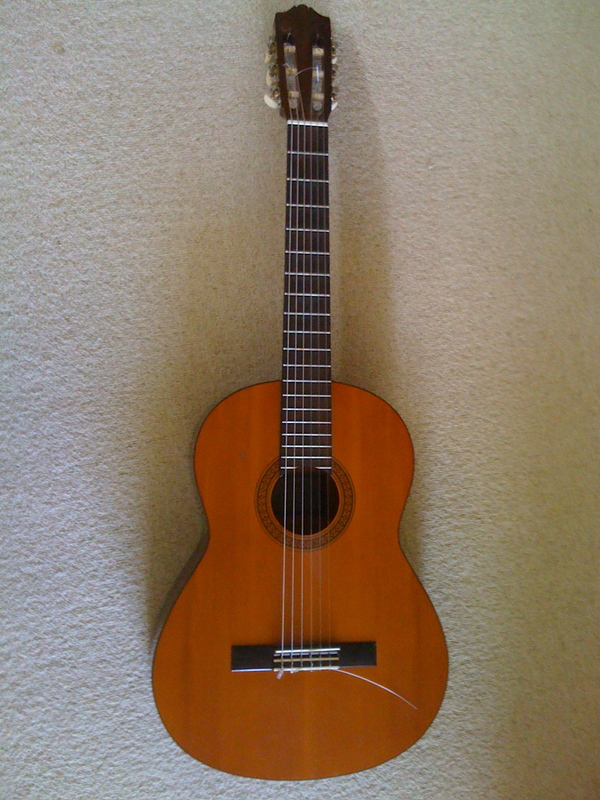 It was £10 in 1980, and is responsible for my love of playing music. Explains a lot, perhaps. I can’t say how delighted I am with this development – it’s not only beautiful in its own right but it’s made the studio really personal, referencing some instruments that have been with me most of my musical life. 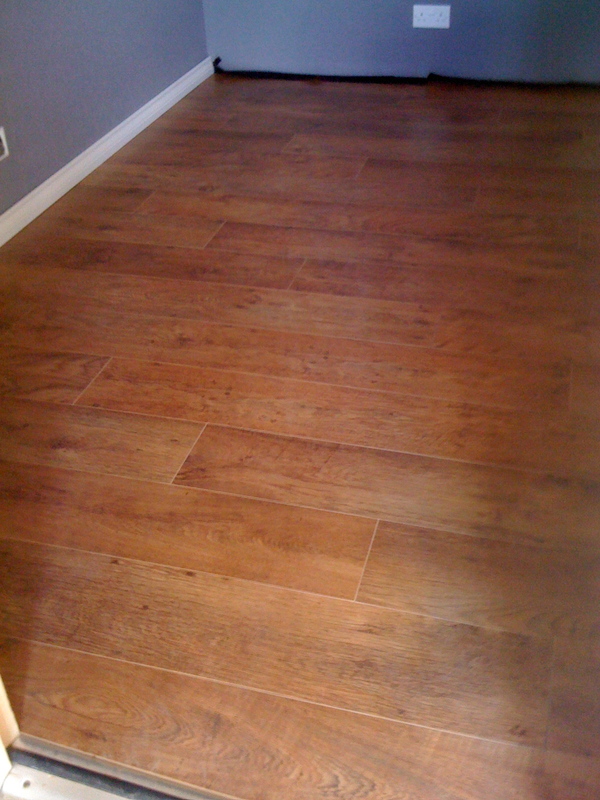 Here's the live room laminate floor, which Artis laid this morning. Beautiful! So, to sound recording issues. I had a long chat with Howard (the ‘Studiowizard‘) over the weekend (all our chats are long – when two geeks collide it’s always the way). Obviously the whole of the live room is ‘dry’ rather than ‘live’ due to the small dimensions involved – it’s too small to get a useful room reverb going, and anyway, it’s always easier to add reverb to a dry signal than to try to dampen a lively room. 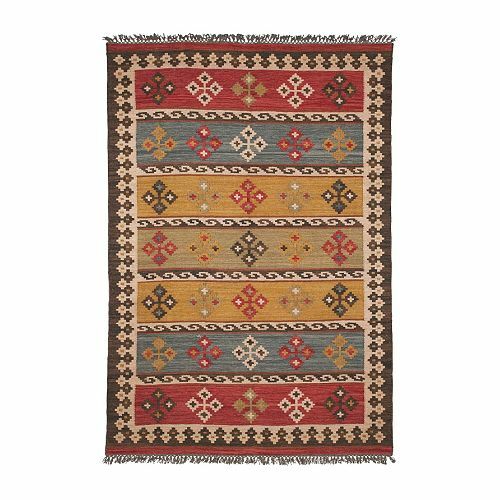 But wooden floors can still be great for acoustic guitars and drums, even in an otherwise damped room (a while ago I took a recording tip from Davey at the University, which is to record acoustic guitarists on wooden boards for extra reflections). 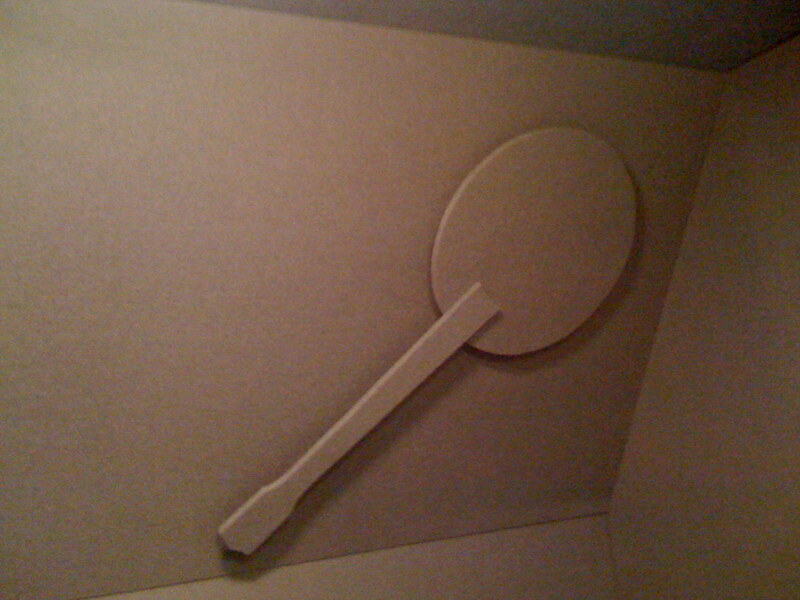 So for the best of both worlds, the plan is to lay high-quality wooden laminate on a bed of fabric (to prevent squeaking floorboards), and then to buy a large IKEA rug on which to put the drum kit; the laminate is pretty tough, but I don’t want nasty bass drum spikes spoiling my nice wooden floor.